GPRS, Wi – Fi Module, Card Reader Module Based Hand Held Device. Time & Attendance is made easy & manageable with irrefutable personal Identification using “Touch-n-Go” Biometric Finger Print Technology.There is no need for ID cards, with real-time Finger identification in 1: N Mode. 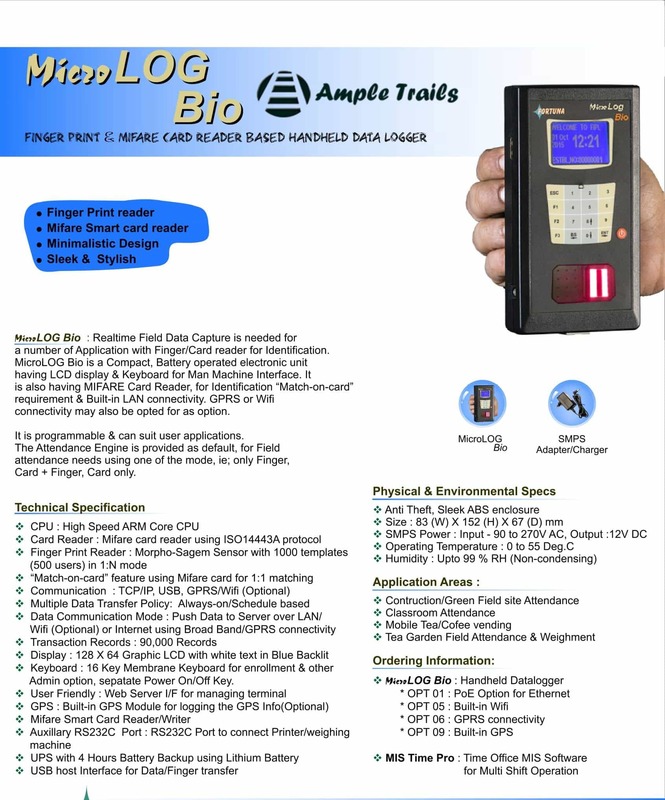 MicroBEN_Bio is the self-contained device with FVC 2004 & FVC 2006 Award Winning Finger Print Sensor to enroll & store the Finger record, Identify users, save event logs and provides the interface with Computer for generating MIS Attendance Reports & data required for Payroll Calculation. An HID Proximity/iClass or MIFARE Smart Card/ EM Proximity Reader may be integrated inside. The Finger Print template can be stored on iClass / MIFARE Card. Punching. The Finger Parking angle & the guide is perfectly engineered to ensure impeccable finger scanning. IN/OUT. With FingerPrint Module, Key Pad & an RF-based Reader (optional), it gives the operator a choice of access modes in any combination of Fingerprint, Card & PIN entries. Finger Print enrollment using MicroBEN_Bio is done once in the built-in memory. User places their enrolled finger on the finger sensor for clocking IN/OUT. The MicroBEN compares live finger with the finger stored in built-in memory and then stores Attendance data only upon “MATCH”. LCD displays Employee Name and “Granted” message upon authentication (with Date & Time). Optional : The Proximity Card is shown on the reader. If the card is Valid, user is prompted to put the finger on fingerprint reader. User-friendly Reports can be generated by Time Pro Software, a high end Attendance Analysis software (optional). Networking of MicroBEN’s can be accomplished via the RS232C/RS485 or Ethernet (LAN/WAN/WiFi) or dial-up modem communication (using suitable External hardware). The attendance data can be pushed from anywhere in the world, in online mode using Broad Band to a Server. GPRS may also be used as the medium for data communication. In College, taking Attendance for every class is repetitive, non-productive activity, yet mandatory. The traditional method of calling of Roll-call & marking Attendance register is being followed for ages now, which creates the need for digitizing this process by an accurate, faster & convenient electronic tool involving biometric verification of student’s finger. DIY (do-it-yourself)- The students shall punch their own attendance accurately & conveniently, while the lecture is ongoing, thus saving time spent otherwise. Eliminate the probability of proxy attendance, thereby fixing the known leakage. Automate Entry of Attendance Data in the college Academic MIS to capture Human errors/bias. Visibility of attendance data online among students & parents for transparency. AmpleTrails has evolved a classroom attendance solution, “smart Roll-Call” which compiles to above requirement besides being faster & the effective tool to handle large lecture Halls where even roll-call is also not possible. It is a solution consisting of Hand-held Biometric Hardware & Application software to generate Analytical attendance report. Micro LOG Bio automates and provides a convenient way to quickly record student attendance using Biometric Fingerprint based technology, to ensure identification accuracy, prevent errors and eliminate Proxy attendance even from identical twins. Micro LOG Bio, is a Handheld, portable and rugged device (fall-proof up to 2 m). The device has a battery backup of 4-6 hrs with inbuilt WiFi module & LAN port for Data communication. One time Register students and professor Fingerprint for Biometric attendance system. Micro LOG Bio is configured initially with Master Data like the Professor, Courses being taken by him for semester & the students registered for the course under the said Professor. During each lecture, the professors carry the Micro LOG Biodevice and logs in using his finger punches on the device. After the professor logs in, the subject drop-down will appear on the screen to select the class subject & marking it ready for student attendance. The Micro LOG Bio is handed over to students to pass it around each student for finger punching. Upon completing the Attendance of all the students, the device is returned to the professor. The professor punches his finger again to log-out from the device. After the professors log-out, which is equivalent to closing the Attendance Register, the data Are pushed to server in bulk mode & posted in the Application database for online Attendance report generation. Accurate Attendance: Educational institutions can centrally and accurately student attendance to prevent proxy attendance and errors/delays in Attendance data entry from Attendance register, which are common problems involved in manual attendance marking. Convenience: The handheld biometric device is convenient to be carried by the professor to the classroom and also for student to hold in hand and mark their attendance by simply scanning their finger, without any training & infrastructure. 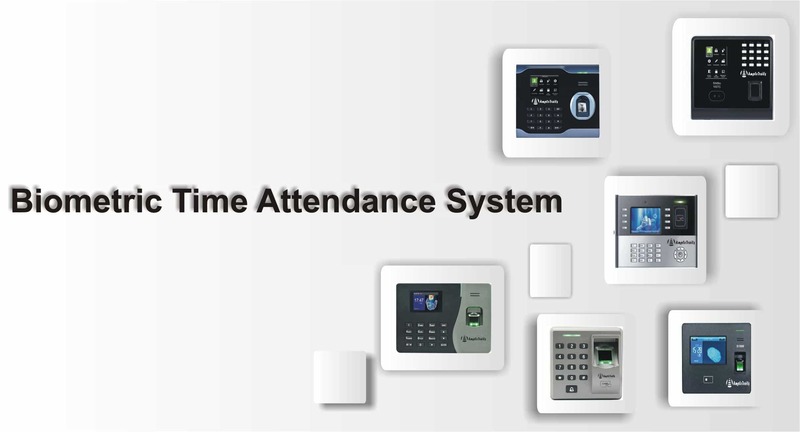 Saves Time & Reduce Paper work: Biometric based student attendance system saves the valuable lecture time, everyday (normally 10% of the class time) to record class attendance in less than 2 seconds per student. Increases transparency between student, Professor and parents: A separate login and notification facility in Web Based Application software is available for students, professor and parents to increase transparency of college attendance systems. What are the types of report obtained? Daily Report (B) Weekly Report (C) Monthly Report (D) Semester Report. Where the solutions are currently deployed? The smart Roll-Call solution is successfully deployed in the best technical Institutions of India. The referrals may be provided on request. Biometric Time Attendance Machine MT100 (Portable Device) is a fingerprint and RFID card reader specialized for time attendance application. The portable feature and long battery life makes it perfect for off-site time management. While tracking time and attendance accurately, it helps increase efficiencies in managing a mobile workforce on remote sites. 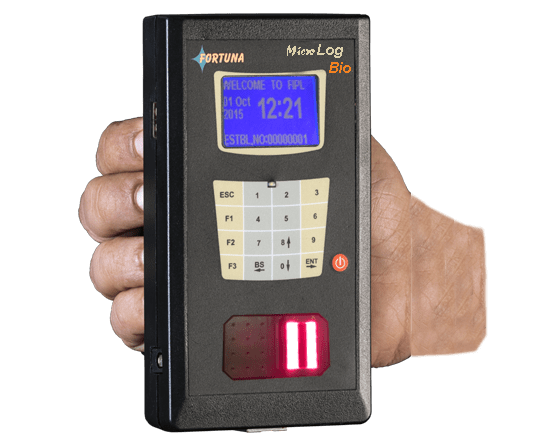 MT100 portable time clock is highly demanded in Teacher Student Roster Verification, Construction Sites, Logistic Industries, Large Farms and the Mining Industry etc. biometric attendance machin is end user divice ?